Travel Management | PRESS RELEASE – In line with ExecuJet’s worldwide development plans, ExecuJet is pleased to announce the expansion of its Mexico-based services, offering a full portfolio for aircraft management and charter services in Latin America and the Caribbean. Following ExecuJet’s International reputation for quality, safety and service ExecuJet Mexico will offer a truly bespoke charter service to the clients in Latin America and the Caribbean. ExecuJet has a full portfolio of Charter Aircraft available in the region. As of 1st of January ExecuJet Mexico has secured two new aircraft under an exclusive Charter Management agreement and is pleased to advise potential clients that the Global Express and Falcon 900B are available for short and long term assignments. These aircraft join three PC12´s that ExecuJet Mexico already has available for charter in the region. Furthermore 4 PC12 aircraft have joined the fleet to compliment a 7X, CL300 and a DA2000 under management by ExecuJet. The expansion means that ExecuJet will have Management Operations at two Mexican Airports (Del Norte and Mariano Escobedo International – Monterrey). “ExecuJet has been established in Monterrey, Mexico for a number of years looking after one principle client, but now we feel the time is right to expand our profile and business in this region,” says Gerrit Basson, Managing Director ExecuJet Aviation Group. Operations Director for Mexico is newly appointed Mark Hardman, who brings 22 years of aviation experience having previously been employed by Bombardier Skyjet International in London. Mr. Guillermo Prieto has been appointed Sales Director for Mexico and Central America. Guillermo has a broad background in aviation and has acted as a sales agent in Mexico representing various manufacturers for more than 20 years. The ExecuJet Aviation Group is a leading global business aviation organisation offering a diverse range of services including pre-owned and new aircraft sales, aircraft management, aircraft charter, aircraft maintenance, aircraft completions management and fixed base operations. Headquartered in Zürich, Switzerland, the ExecuJet Aviation Group has operations in five regions – Asia Pacific, Europe, Latin America, Middle East and South Africa, embracing a workforce of over 750 experienced staff. The ExecuJet Aviation Group manages a staggering 150 business jets worldwide under the most stringent safety standards. Its commercial fleet is operated under the regulatory umbrella of eight regional civil aviation issued air operating certificates (AOCs). The ExecuJet Aviation Group is a sales representative and dealer across four continents for Bombardier Business Aircraft’s family of Learjet, Challenger and Global Express business jets. They are an exclusive agent outside North America for the sale of the 8 to 12-passenger Aerion Supersonic Business Jet. What Happens to the U.S. if Mexico Collapses? Here’s an interesting little piece that was aired on Fox News’ Glenn Beck Program this week featuring an interview with Texas Senator Dan Patrick (R). I’ll let you be the judge. Comments, of course, are welcome. LAKE FOREST, Calif., /PRNewswire/ — Juan Carlos Camarena Herrera and Jose Manuel Villanueva have become the newest Johnny Rockets franchisees, the Company announced today. The agreement calls for the opening of a minimum of five restaurants during the next five years, opening the first restaurant within calendar year, 2009. Camarena and Villanueva will own and operate classic restaurants in the state of Jalisco, Mexico, and the Nuevo Vallarta region, in the state of Nayarit. Located on the central west coast of Mexico, the states of Jalisco and Nayarit boast a combined population of nearly 8 million people. Since 1986, Johnny Rockets has offered the food, fun and friendliness that remind guests of timeless, feel-good Americana. Every Johnny Rockets restaurant serves simple, great-tasting food from a menu of all-American favorites, including juicy hamburgers, classic sandwiches and hand-dipped shakes and malts. It’s the place to go for fast, friendly service, flavorful food, uplifting music and relaxed, casual fun. Headquartered in Lake Forest, Calif., Johnny Rockets has 255 corporate and franchise-owned restaurants in 29 states and 11 countries, including those found in Six Flags amusement parks and aboard Royal Caribbean cruise ships. Johnny Rockets is currently franchising new restaurants in most markets. To learn more about Johnny Rockets, visit johnnyrockets.com. President Felipe Calderón urged the Mexican Navy marines not to shirk from their task of confronting adversity and not to allow their minds to be influenced by weakness, since perseverance, discipline and coordinated work are the key to success. As he led the farewell ceremony for the Cuauhtémoc Training Ship in the port of Acapulco, Guerrero, the President declared that the Navy is a crucial element in the challenge facing Mexico today in the fight to combat organized crime and restore Mexicans’ tranquility. “Thanks to your determination, we have inflicted heavy damage on the operating networks of the main criminal organizations, capturing dangerous kidnappers, drug traffickers and killers to put them in the hands of justice,” he said. President Calderón was informed of the Navy’s confiscation last week of a fishing boat that was transporting seven tons of cocaine. He said that this action is a clear sign of Mexico’s firm commitment to combatting organized crime and its willingness to work in a coordinated fashion on an international scale. Accompanied by Navy Secretary Marianao Francisco Saynez Mendoza, National Defense Secretary Guillermo Galván Galván and Governor of the State Zeferino Torreblanca Galindo, the Mexican President urged the unit to reject and cope with the criminals´ action through denunciations and above all through the mechanisms implemented by Federal Government and the Armed Forces. “Today, we must join together to reject, point out and report on criminals. We must unite and change aspects of our actions or omissions that have permitted or encouraged this point of impunity, particularly the corruption of civil servants’ who have betrayed the supreme duty of serving the nation. We must not allow discouragement and on the contrary, let every cowardly action encourage us to act with more determination every day and never give in or resign ourselves to surrendering our society and our families to criminals’ unpunished action and interests. That is the task of all Mexicans,” he declared. 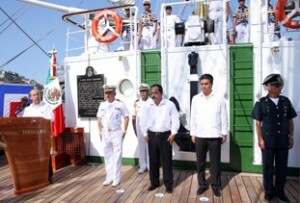 The President added that he hoped when the Cuauhtémoc Training ship, the Gentleman of the Seas, returns after its passage through 10 ports in the United States, China, South Korea, Russia and Japan, Mexico will also have overcome the world economic situation and work to restore its growth. “And then, when the moment of adversity has passed, what will remain is having maintained the course, actions and works Mexicans have undertaken together to lead our country to a different and better future,” he said. President Calderón recalled Vicente Guerrero 178 years after his death and urged the Marines setting sail to today to dedicate every day of their lives to Mexico, like Guerrero, one of the promoters of Mexico’s Independence. As noted on these pages before, the World Baseball Classic is about to begin starting March 8, in Mexico City. There are 4 pools worldwide, with the other first round games slated for Tokyo, Toronto, and San Juan, PR. The first round games in Mexico will pit Mexico vs. Australia and Cuba vs. South Africa. The second round games will then move on to San Diego, with the finals played in Los Angeles March 21 – 23. This is great competition and illustrates the popularity of baseball worldwide. For some interesting comments from Mexico City check out ex-Dodger skipper Tommy Lasorda’s blog, where there are sure to be some entertaining stories. ESPN2 will be televising the games live, as well as the new MLB cable channel, and you can follow the results on this site http://mlb.mlb.com/wbc/2009/schedule . The next time you are in Mexico, check out a local game. It still doesn’t hold the same passion with the Mexican people as does soccer and bull fights, but there is more scoring than the former and less blood-shed than the latter. They even sell hot dogs and peanuts. The corridor from Tijuana to Ensenada has seen an unprecedented growth spurt the past several years, with concrete being poured and hammers flying at a pace that seemed unsustainable to many of us long-time observers. Equity money was easy and speculators were snapping up condo units as fast as the criminal U.S. bankers could draw up the loan docs. It had to bust, and now it has. But before the poor saps who weren’t able to spin their deals and cash out start feeling sorry for themselves, they should take some solace in the fact that America’s self-appointed real estate genius didn’t see it coming either. Although I’m sure his own money wasn’t in the deal, Donald Trump has pulled his name from a 526-unit hotel-condo development, that now says it has no money to build the project even though individual buyers had spent $32 million on deposits. Easy come easy go, eh Donald? The trouble is that most of the buyers pulled the trigger based on Trump’s involvement. Good luck getting your money back, guys. Meanwhile, about 50 miles down the road, Tiger Woods is forging ahead with his involvement on Punta Banda (they are calling it Punta Brava since Punta Banda has a negative image after many homeowners who hadn’t done their homework lost their investments several years ago…ever heard of ejido land? ), about 11 miles south of Ensenada, near the legendary blow hole. I voiced my opposition to this disaster in a previous post , and nothing has happened since to change my mind. I have nothing against golf courses and I play the game somewhat competently, but this is not the place to put one. At this point, with the global recession sinking its teeth into every economy, I give this project less than a 50/50 chance to ever see completion. Tiger, take a lesson from Trump and pull out now. Concentrate on regaining your swing after your knee surgery for the upcoming Masters. RIVIERA MAYA, Mexico, February /PRNewswire/ — As resort residences across the world are halting construction and pushing completion dates back, Banyan Tree Residences Mayakoba is bucking the trend by finishing all construction on schedule. Final touches are being made to Banyan Tree Residences Mayakoba this month, making the property the first and only completed, whole-ownership residential project on the coveted Mayan Riviera. The property’s unique status significantly mitigates the risk often associated with pre-construction purchases for those who are interested in purchasing a resort residence. Banyan Tree Residences Mayakoba offers potential buyers the rare opportunity to actually see, tour, and stay in the residence they wish to purchase before doing so. On January 15, 2009, Mr. Ho Kwon Ping, Executive Chairman of Banyan Tree Hotels and Resorts, paid a visit to the site to review the progress of Banyan Tree Mayakoba. Located within the Mayakoba integrated development, a unique community composed of four leading hoteliers – Rosewood, Fairmont, Viceroy and Banyan Tree – owners at Banyan Tree Residences Mayakoba will have access to the best of the best in luxury spas and fitness centers, top chefs serving wide-ranging cuisine at more than fifteen dining establishments, PGA TOUR golf course El Camaleon, designed by Greg Norman, and the culture, arts and entertainment of the celebrated Riviera Maya region. Mayakoba’s master developer, OHL – among the largest construction and service groups in the world – recently announced plans at the International Tourism Fair to supplement their initial Mayakoba investment of more than $1 billion with yet another several hundred million dollars over the course of the next few years. The leading international operator in the boutique resort, residences and spa industry, Banyan Tree offers a signature blend of romance and travel with a green conscience. The philosophy behind the hotels, resorts, residences, spas, retail galleries and destination club is based on rejuvenation of the body, mind and soul – a Sanctuary for the Senses. To date, the Banyan Tree Group manages and/or has ownership interests in over 20 resorts and hotels, over 60 spas, in excess of 60 retail galleries; as well as two golf courses.